Use hanging baskets around your patio, deck or on shepherd's hooks throughout the yard to add vertical color to your landscaping. 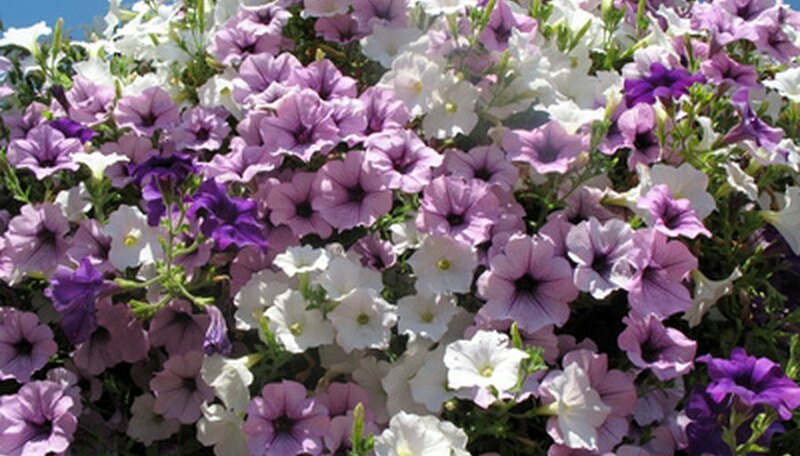 Both annual and perennial flowers thrive in hanging baskets, if the baskets are properly cared. Like other container gardening methods, hanging baskets are prone to drying out. Moss-lined wire baskets dry out the most quickly because water can evaporate from all sides. Watering your hanging basket properly ensures your flowers thrive throughout the gardening season, producing bright blooms all summer long. Check the moisture in the basket every morning. Water when the top of the soil begins to feel dry. Check the baskets again in the evening during hot, dry weather, as hanging baskets may require up to two waterings a day. Take the flower basket down from its hanging hook, if possible, and set it on a firm surface. If not possible, use a step stool so you can see the soil surface as you water. Water the basket from the top, thoroughly wetting the soil surface. Water until the excess moisture drains from the bottom of the hanging basket. Avoid getting the foliage and flowers wet, as this can lead to fungal problems. Fertilize every two weeks with a balanced soluble plant food, following label application instructions. Frequent watering flushes nutrients from the basket so it must be replenished regularly to ensure healthy plants. Sphagnum moss and coconut coir baskets dry out the quickest. Use a plastic lined moss liner to help prevent this quick evaporation. Leave 1 to 2 inches of space between the top of the soil and the baskets rim to make watering easier. Wet foliage leads to disease, but is difficult to prevent when an evening watering is necessary. Water at least two hours before sunset so the foliage has time to dry before cooler nighttime temperatures.